If you would like to be listed in our consultants directory, please contact our Chapter Administrator, Monica Powell. DTD Consulting specializes in transformative capacity building - positive change and growth for charities. An experienced researcher and facilitator, Dree provides guidance and expertise, helping establish new organizations, enhancing board and staff relations, crafting and implementing strategic and operational plans, as well as revitalizing, restructuring and establishing new fund development programs and campaigns. She provides organizational audits and feasibility studies, creates effective major and planned giving programs, and works with clientele to streamline operations. Dree is a successful recruiter of key staff and leadership volunteers. Many years of varied experience to share with prospective clients. Former high school teacher and guidance counselor. Former private school Headmaster. Former Director of Development and Alumni Affairs. Former university senior administrator. 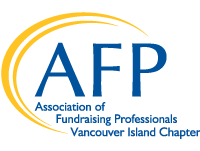 First Canadian to sit on the restructured board of the National Society of Fund Raising Executives now known as the Association of Fundraising Professionals (AFP).Founding President of the Vancouver Island Chapter of AFP. First Canadian to sit on the board of the AFP Foundation. Founding Director of the AFP Canada Foundation. Former Co-Chair of the AFP Canadian Initiatives Task Force. Presented and mentored at AFP International conferences. Have staffed, served on the board, established and chaired Foundations and Societies in Quebec, Ontario and BC. Currently sit as a member of the International Development Committee of AFP and as an advisor on the local chapter board of AFP. Have been a member of Rotary for over (30) years and have been Vice-President of one club and President of another. Certified CFRE in 1984. Masters in Higher Education Admin. - McGill University, PR certificate course- McGill Extension Dept. Experience and expertise in annual campaigns, capital campaigns, board development, community audits, staff/volunteer development/tutoring/mentoring/coaching, relationship building, major gift development/prospecting, strategic planning, staff organization review and audit, sponsorships, writing, presentations, volunteer co-ordination , fundraising course teaching/facilitation, etc.